This week City Council returns from a two week break from work sessions and regular sessions. A full schedule of the week’s work sessions and various committee, board, and commission meetings and agendas is provided below. Cultural District Discussion: We will be discussing the creation of a cultural district in Denton. In early 2018, Council directed staff to look into Denton’s participation in the Texas Commission on the Arts’ (TCA) Cultural Districts Program. 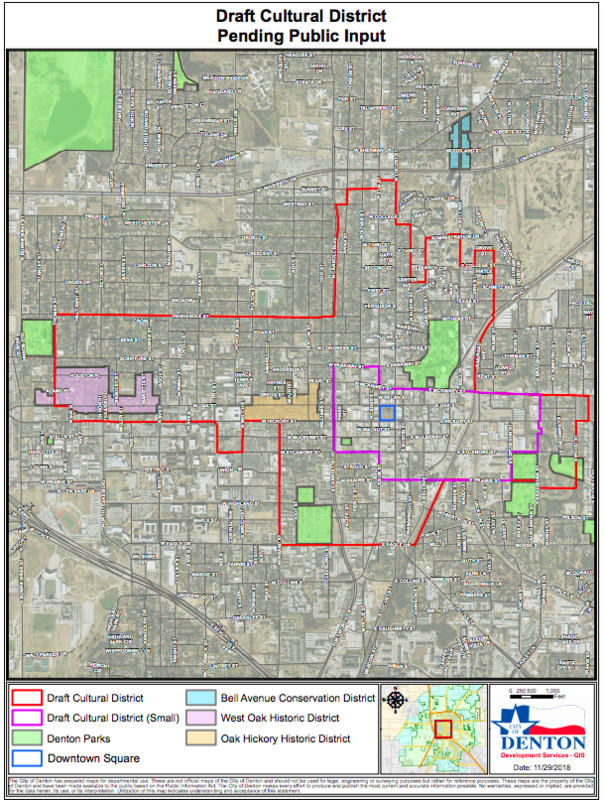 Between May and August, an informal group of stakeholders met several times to discuss the idea of a cultural district in Denton and some of the details necessary for formation. The 2019 cultural district application cycle began in January with the submission of a letter of intent and ends in June with submission of the full application. While staff can complete portions of the application, a consultant will need to be engaged to assist with certain critical components. Prior to work beginning on the application, staff needs further direction from Council on the boundaries of the cultural district, the composition and structure of the cultural district committee, and a budget for startup costs. Staff is seeking Council direction on the boundaries of the cultural district (Exhibit 3) and whether the cultural district governance should be handled by the existing Public Art Committee or a new cultural district committee. Full agenda item and backup material. City Election Polling Locations Discussion: City staff contacted the May 2018 election day polling locations to confirm availability to serve as a polling location for the May 4, 2019 municipal election. All locations, with the exception of Ryan High School are available to serve as a polling location on May 4. Ryan High School is not available because several student activities and sporting events are planned for May 4, which will severely limit parking availability for voters. The Denton Independent School District (DISD) Annex Building, located at 230 N. Mayhill Road is available to serve as a polling location on May 4. The DISD Annex has ample parking and, is located in very close proximity to Ryan High School, and would cover the same precincts that voted at Ryan High School in 2018. 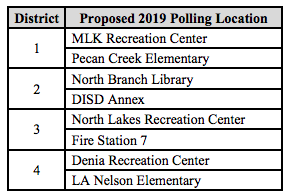 On February 5, 2019 City Council will consider adopting an ordinance designating the polling locations in the table below for the upcoming May elections. Full agenda item and backup material. I would also like to continue our discussion and consideration of establishing – at a minimum – one additional early voting location at the University of North Texas for the over 1,000 employees there as well as full time and part time students who reside within Denton and are registered to vote in the City of Denton. Conservation and Landscape Code: While the current tree preservation regulations served to protect some of the existing tree canopy, more is needed to manage and maintain essential tree canopy and to provide clear guidance for tree preservation and mitigation within the city for all stakeholders. Public hearings before the full City Council will follow at a future date. This update is important to me and something that I have been working toward since I was first elected to City Council in 2015. Full agenda item and backup material. Sustainability Events for the Public: I encourage citizens of all ages to consider participating in the upcoming sustainability education and outreach events. Volunteers and staff are working hard to help our community. To register for an event visit our facebook page (www.facebook.com/sustainabledenton) or the website (www.sustainabledenton.com). You can also subscribe to our newsletter by emailing sustainabledenton@cityofdenton.com or by checking the newsletter box after registering for a workshop. This is a proposed 6,000-acre master-planned development located within southwest Denton. Both Cole and Hunter Ranches are located within the city limits and are designated as Master Planned Community Districts under the Denton Development Code. The proposed project would require significant public infrastructure such as water, wastewater, drainage, and road facilities, which would be paid for up front by the developers. The developers have requested that the City of Denton consider the establishment of a municipal management district (MMD) to enable recapture a portion of the cost of construction of the public infrastructure. A number of questions arose during the January 15th work session on this topic including but not limited to: the documents required to create an MMD; conformation to the Denton Plan 2030; use of tax incentives by and within the MMD; infrastructure costs for the project; determining what parts of the potential development would be served by Denton Municipal Electric; establishment and management of park land; land for public safety facilities; tree preservation; affordable housing; managing gas well sites and setbacks. Full agenda item and backup material. There is a lot to work through on this potential development and the long-range fiscal impacts on revenues vs. operating costs to serve the development over time have to be modeled, understood, and fully considered. I have my concerns setting up an MMD, which is an extra taxing jurisdiction, within the City of Denton. Tyson Sales and Distribution Inc. is a subsidiary of Tyson Foods, Inc. Tyson Foods Inc. is a very large and well-established U.S. company that sits at number 297 on the Fortune Global 500. With revenues over $38 Billion and Profits over $1.7 Billion, it is hard to fathom a legitimate need for Tyson to receive an incentive package from the City of Denton, Denton County, or the State of Texas to offset risk and development costs for this 350K square foot cold storage and distribution facility. My bottom line is that the project doesn’t warrant an incentive. There is no substantial risk for the operator. If there was some risk, Tyson wouldn’t want to locate here because no incentive (no matter how big or small) can overcome the long-term negative impacts a bad location decision will have on a company. We have already put in the transportation and utility infrastructure to develop this industrial corridor for uses such as what Tyson has proposed. We made this investment to make this area attractive and project-ready – not so that we would have to offer incentives to attract business. We have seen similar cold storage and distribution facilities come in and operate successfully. We have the transportation access at the I-35 east/west split that Tyson needs in this region. We have the workforce access they need to staff their 100 full time employees. Further, even without granting Tyson the 25% annual tax abatement they are requesting, they would still qualify for the Economic Growth Rider from Denton Municipal Electric (DME). Denton’s 2018 Policy for Tax Abatement and Incentives identifies “significant consumers of municipal utilities” as a recruitment target because large customers in sectors like manufacturing and refrigerated/frozen food distribution use energy consistently around the clock. Steady industrial users allow DME to purchase power at a lower price and receive a better rate of return overall, which helps keep rates steady for all ratepayers. DME’s Economic Growth Rider (EGR) is an economic development tool used to recruit customers like Tyson to Denton. Available only to qualified customers, the EGR is a five-year, sliding scale reduction to a customer’s demand charge (50% down to 10%). Based on preliminary calculations, Tyson will be eligible for an estimated $449,886 EGR if it meets the qualifications. The demand charge over the ten-year period is $2,549,354. The site, the market access, the existing infrastructure, and the EGR from Denton Municipal Electric should be enough to land Tyson. I want us to start playing more aggressively to our strengths (of which we have plenty) and not be in the game of doling out corporate handouts to global companies with over $38 Billion in revenues. Let’s use incentives as a tool in a more targeted manner to develop and recruit smaller, established and emerging businesses from around the world and in our own backyard. There have been a lot of recent coyote sightings and encounters across the region. And District 2 has had its share of sightings and killed outdoor pets. In response, the City of Denton has launched a new map to track coyote sightings. Residents can report sightings via the Engage Denton app (available at www.engagedenton.com), which captures the location of the sighting. Sightings are then loaded into the interactive map where they will remain posted for 90 days. 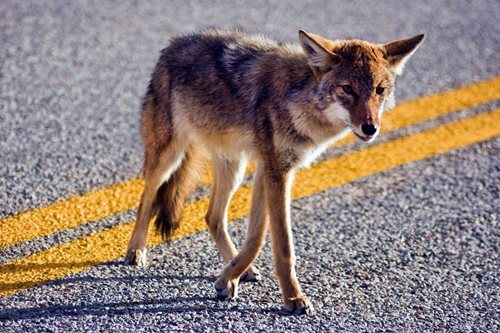 The coyote sighting map is available by going to www.cityofdenton.com/animalservices and clicking on “Wildlife” under important resources. While the map will help residents identify areas where sightings occur, residents are also encouraged to get information about what to do if they encounter a coyote. Residents are encouraged to remove and limit coyote food sources, keep small pets indoors or under close supervision, and properly dispose of or store all garbage, compost, pet food, and grill drippings which attract rodents, rabbits, and other coyote prey. Residents can also make their yards less inviting by cutting back brush and sealing off crawl spaces. If residents encounter a coyote, they can attempt to scare them away by making loud noises and waving their arms. Remember to take a whistle or tennis ball on walks, as these can also be used to scare coyotes. Never approach a coyote, and immediately report any coyotes displaying abnormal behaviors or illnesses to Denton Animal Services at 940-349-7594. For any attacks or aggressive animal sightings, call 911.